Our licensed professionals provide therapy for children, adolescents, and/or adults in a one-on-one setting to assist clients in various areas of his or her life that are inhibiting personal achievement, satisfaction, and growth. In individual therapy, the professionals draw from selected therapeutic approaches and incorporate techniques to assist clients in gaining clarity, focus, and insight. Together, we will achieve or assist you in attaining your personal goals and growth. 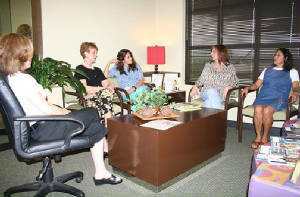 Areas addressed in individual sessions can cover a wide-range of topics, which may include relationship issues, work-related issues, depression, grief, trauma, anger management, anxiety, substance abuse and/or addiction and chronic health difficulties as well as various other problems or difficulties that often times become apparent during individual counseling. Our licensed professionals provide therapy for couples experiencing functional difficulties affecting quality of life and their relationship. In couples therapy, the professionals assist both individuals in addressing their needs and/or issues as a couple and individually. Couples counseling may require individual sessions in addition to joint sessions with the therapist. 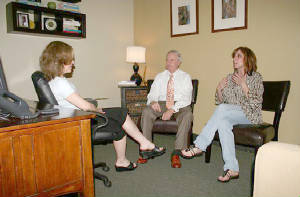 Areas addressed in couples’ counseling may cover a wide-range of topics such as communication between the individuals, infidelity or trust issues, unrealistic expectations, belief systems, empty nest, adjustment to life changes or abuse as well as any topic that could be discussed in individual therapy that may be more effectively addressed jointly by the couple. Our licensed professionals provide therapy for families experiencing difficulties creating a diminished quality of life for members within the family. Family functioning is an ongoing challenge as family structure development is dynamic and ever-changing. 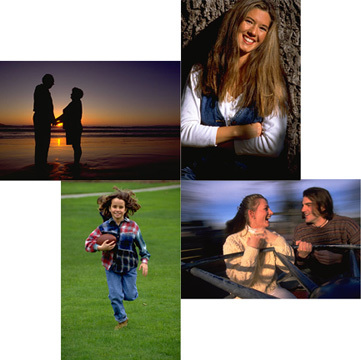 Areas addressed in family therapy include areas addressed in individual sessions and/or in couples’s sessions. Families operate as a system; therefore, its members are affected by issues and concerns of every member within the family system. Problems within the family can impact communication, functioning and cohesiveness between family members. Our professionals assist families in achieving balance within the family in order to improve functioning as a whole while promoting individual growth within the system. Support and/or educational groups can provide a positive experience for group members. In the counseling field, group work has become a viable treatment of choice in helping people improve. There are groups available for addressing many issues and appropriate for many different clients. Often times clients feel their problems are unique to them; therefore they can become limited in considering the number of options available. Groups allow clients the opportunity to experience long-term issues/problems being played out in the safety of the group setting while providing different options to consider, discuss, and practice within the group while having the opportunity to receive feedback in a safe environment. Oakmont Counseling Center will conduct "open groups" and "closed groups". Open groups allow new members to enter the group at any stage of the group. Closed groups are comprised only of those members who constituted the original group. New members may not join during the course of therapy; however, closed groups will repeat periodically. We provide education, emotional support, and increased awareness for clients with similar experiences. Topics will vary according to caseload and client needs. If you are interested in support group, talk to your therapist. Your therapist can recommend an appropriate group or possibly formulate a group as topic demands. Addressing contemporary teen issues as a family, such as cyber addiction, depression and substance abuse, intimate partner violence, boundaries and assertiveness, or reconnecting with your teen. Put the fun back into parenting with logical techniques delivered with love. Learn play therapy techniques to use at home to strengthen your relationsip with your child. Improve your life and relationships by controlling those anger outbursts. Helping children address issues that may arise in their everyday interaction with peers. Creating a safe environment in which children can join others and express the grief they experience from death of a friend, family member or pet, divorce, or even a significant move. Workshops, seminars, and classes on a variety of topics are available to area schools, parent and teacher associations, community groups, and area churches. Topics may include, but are not limited to: positive parenting, effective communication and team building. Oakmont Counseling Center offers education programs for professionals and the public. Please call or e-mail for additional information on groups. Children's play is not mere sport. It is full of meaning and import. For children, play is the central activity of childhood. Children can play any time and any place. They do not need to be taught how to play or what to play nor do they need to be prompted or forced to play. Play is spontaneous, fun, voluntary and without goals to attain. However, play is critical to the development of the child. It is through play that children explore and learn about the realistic world of space, time, people, animals, and inanimate objects. It is through play that children expand their awareness and expression of self. Play relieves feelings of stress and boredom, connects people in a positive way, stimulates creative thinking and exploration, regulates emotions, and boosts confidence. (Landreth 2002). Play is a child's way to communicate: It is the child's language. Children communicate everyday through their natural language of play. In play therapy, it is no different. Because children are young and relatively new to the world, they are not yet capable of articulating with words the feelings and concerns they are experiencing. Instead, their expressions of concern manifest in problematic behaviors such as poor problem solving, poor choices, acting out, disobedience, and other inappropriate behaviors. In play with a trained professional, a child's choice of toys becomes the child's words and the course of play becomes the child's language. The therapist strives to establish a positive relationship providing a corrective emotional experience essential to the healing process. A safe, warm, and accepting atmosphere in which the child has the freedom to express through play (consciously or not) what is troubling them is created by the trained professional. The relationship and environment is critical in facilitating improvements in the child's ability to develop effective coping skills. 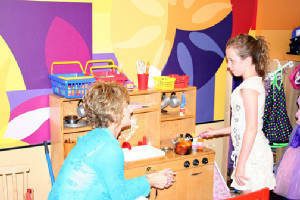 Children learn in the therapeutic atmosphere of the play room, new coping skills and new ways of interacting, communicating and behaving. Play therapy helps children change the way they think about, feel toward, and resolve concerns (Kaugars and Russ, 2001). The most troubling problems can be confronted and lasting resolutions can be discovered, rehearsed, mastered and become lifelong strategies (Russ, 2004). Research supports the effectiveness of play therapy for a wide range of problems and is especially appropriate for children ages 3 to 12. However, play therapy can benefit the child in us at any age, including adolescents and adults. A child comes in for therapy, terrified and hiding behind the legs of her foster parent. She has been sexually abused and refuses to talk. An adolescent is compelled to come in for counseling because of his delinquest behavior. He is angry and refuses to talk. A couple on the brink of divorce seeks counseling as a last result. They can't communicate with each other, much less a therapist. A family walks into the office in crisis, with parents who feel helpless and children who are acting out. The system is crumbling. What do you do? Children, adolescents, adults, couples and families often times find themselves aching to express their thoughts and emotions, but simply cannot find the strength, courage or clarity to put their thoughts and emotions into words. For many clients, thinking about counseling and sharing intimate thoughts, fears, and pain with someone else, in and of itself, can be a terrifying experience. To talk about out issues means to confront fearful and/or painful emotions and experiences. Sandtray therapy provides an important venue for communication without directly verbalizing emotional issues. The sandtray process can be used as a medium of self-expression and self-exploration addressing both conscious and unconscious struggles. The sandtray process can provide an enlightening and enriching experience requiring no creative or artistic ability from the client since the experience is free from judgment. It's funny how dogs and cats know the inside of folds better than other folks do, isn't it? 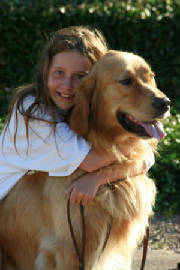 Animal assisted therapy (AAT) in counseling (AAT-C) is using animal(s) as partners in the therapeutic process. The ability for people to form relationships with animals appears to be a natural process that can facilitate rapport building and empathy between the client and the pet. Life's events can often times be painful, physically and/or emotionally. Sometimes in these situations, we need comfort and affection that can often be achieved through the physical contact with animals. Why involve pets in therapy? For some clients, the use of pets may provide (1) the additional motivation needed to engage in therapy, (2) the distraction necessary to address painful issues, whether physical or emotional healing, nurturing and affection, (3) Unconditional acceptance, (4) safety in which a trusting relationship can be accomplished between the client and therapist, (5) calming and soothing effects accomplished through petting or touching pets. AAT-C has been shown as beneficial in the treatment of anxiety and distress, dementia, depression, development disorders, emotional and behavioral problems in children and adolescents, as well as in addressing self-esteem issues, or lack of motivation to receive therapy. AAT-C is not appropriate for all clients. The therapist and the client will discuss the possibility of incorporating a pet in counseling sessions to ensure the client understands the use of a pet, and to facilitate an informed decision. However, the ultimate decision will be made by the trained therapist based on the most appropriate approach for the client and the best use and safety of the pet.